Using serial block face scanning electron microscopy and other technologies, researchers created three-dimensional images of the neocortex of transgenic mice engineered to over-express the human protein, alpha-synuclein, and noted massively enlarged nerve terminals. 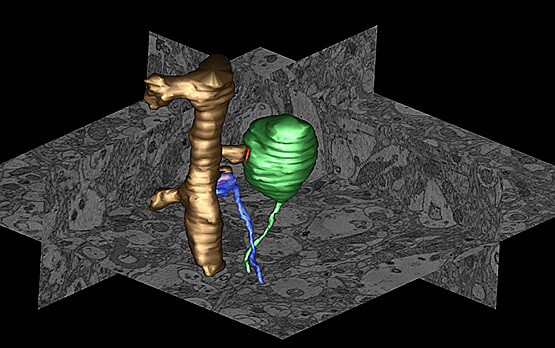 In this image, an over-sized terminal (green) forms a synapse (red) with a dendritic spine (golden). A normal and smaller terminal (blue) forms a synapse with an adjacent spine on the same dendrite. Image courtesy of the National Center for Microscopy and Imaging Research, UC San Diego. Researchers at the University of California, San Diego School of Medicine say overexpression of a protein called alpha-synuclein appears to disrupt vital recycling processes in neurons, starting with the terminal extensions of neurons and working its way back to the cells’ center, with the potential consequence of progressive degeneration and eventual cell death. The findings, published in the February 6, 2013 issue of The Journal of Neuroscience, have major implications for more fully understanding the causes and mechanisms of Parkinson’s disease (PD), a neurodegenerative movement disorder that affects an estimated one million Americans. “This is an important new insight. I don’t think anybody realized just how big a role alpha-synuclein played in managing the retrieval of worn-out proteins from synapses and the role of alterations in this process in development of PD,” said principal investigator Mark H. Ellisman, PhD, professor of neurosciences and bioengineering and director of the National Center for Microscopy and Imaging Research (NCMIR), based at UC San Diego. Parkinson’s disease is characterized by the gradual destruction of select brain cells that produce dopamine, a neurotransmitter involved in regulating movement and emotion. Symptoms include increasing loss of muscle and movement control. While most cases are sporadic – that is, their causes are unknown – there are also inherited forms of PD linked to specific gene mutations and modifications. The UC San Diego researchers, with colleagues at the University of Illinois, Urbana, focused upon one of those gene products: alpha-synuclein. Using a variety of leading-edge imaging technologies, including a new fluorescent tagging technique developed for electron microscopy by UC San Diego Nobel laureate Roger Tsien’s lab and colleagues at NCMIR, the scientists created three-dimensional maps of alpha-synuclein distribution both in cultured neurons and in the neurons of mice engineered to over-express the human protein. They found that excess levels of alpha-synuclein accumulated in the presynaptic terminal – part of the junction where axons and dendrites of brain cells meet to exchange chemical signals. “The better we understand the mechanisms of PD, the easier it will be to develop clinical interventions,” she said. Co-authors are Monica L. Berlanga, Masako Terada, Junru Hu, Eric A. Bushong and Minju Hwang, National Center for Microscopy and Imaging Research and Center for Research on Biological Systems; Mary Ann Yang and Julia M. George, Department of Cell and Developmental Biology, University of Illinois, Urbana; and Eliezer Masliah, Department of Neurosciences, UCSD. Funding for this research came, in part, from the NIH National Center for Research Resources (5P41RR004050-24), the National Institute of General Medical Sciences (8 P41 GM103412-24), National Institutes of Health grants R01 GM086197-05, AG184440 and AG022074, as well as support from the Branfman Family Foundation and the Institute for Systems Biology, as part of the activities of a consortium of researchers linked to the Luxembourg Center for Systems Biomedicine’s research program on neurodegenerative disease.